McVan and Farrell are among four students in UNE’s College of Osteopathic Medicine in Biddeford who, at their own request, spent recent weekends living and working at the home for terminally ill patients. 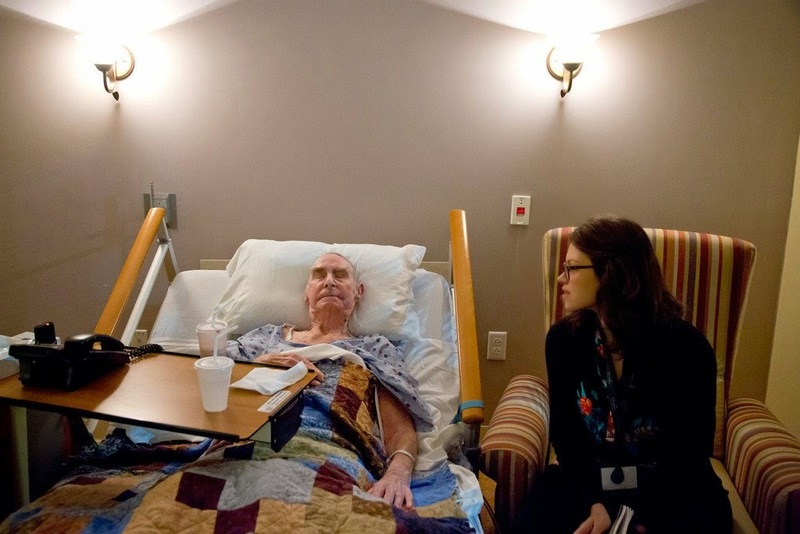 The pilot Hospice Immersion Project provided unique exposure to end-of-life care in a nation whose medical schools are giving short shrift or largely ignoring a growing demand for training in long-term, palliative and hospice care. It also was an intense introduction to the realities of dying and death for students on the cusp of becoming physicians. Admitted in pairs, the second-year med students spent two days learning from hospice staff and helping to care for patients and their families. They stayed in suites where people had died and their loved ones mourned. They followed nurses and physicians on their rounds and journaled about what they saw and heard. They got to know patients and their families and learned what it takes to care for people in their final hours. Farrell urged her classmates to be compassionate but honest with their patients when dealing with issues related to death and dying. And to embrace and promote hospice care as a way of experiencing death as a natural part of life. Wonderful idea. We were raised with the notion that somehow death of a patient was a failure. My Chief Resident in medicine took care of that when I was an intern. My wife is a hospice nurse. Tough work but very humbling. We will all be there someday and likely will want someone to help us through. Thanks for sharing.